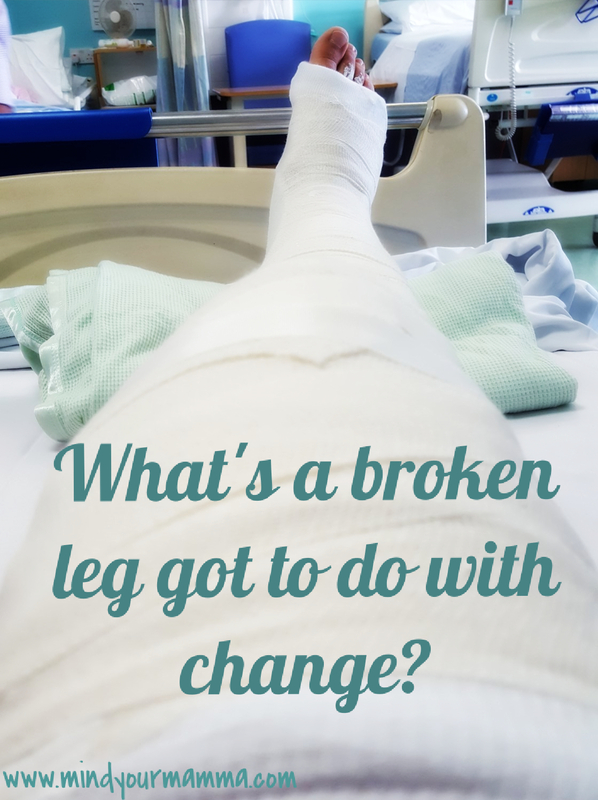 What's a broken leg got to do with change? Quite a bit, as it turns out. Today I’d like to tell you a story. Why today, of all days? Because it’s been 6 months since I fell down my stairs at home doing something very mundane (unpacking) and broke my leg in a pretty serious way. It matters because I want to help you notice change in your life. Change that is intrinsically part of life and that inevitably happens. And I want to hopefully inspire you to use change to your own advantage – to welcome change and to make change happen. So why do I write about my injury so much? Because it’s part of me and my story now. But also because it’s thanks to a blogger breaking his leg and undergoing a similar surgery to mine a few years ago, that I found most of the information that helped me have some sort of idea of what to expect. Because when you are told after a silly fall that it’ll be about 6 months until things get back to normal, it’s a little bit daunting. And today is that 6 months mark. Since my fall I’ve written about my stay in hospital and about how I had to suddenly stop breastfeeding my youngest son. In the early days after starting my blog I wrote about how I stayed positive and how I ‘kept sane’, and about how harsh some people can be when you didn’t hurt yourself doing something inherently dangerous or admirable. And I’ve since written about my gratitude at finally being able to walk again, and about how I am now experiencing and dealing with some mild anxiety and using mindfulness to help me heal. Because no one else tells you these things, and if I can help others, then I’ll have achieved what I set out to do with this blog. But how is a broken leg about change? Well, bear with me as I tell you this bit of the story, because breaking my leg is like one of those moments from the movies where the main character experiences a turning point – you know the one. That time when something happens and life after that isn’t the same as it was. Because the rushed, thoughtless actions I took 6 months ago changed the course of my life. I’m not saying breaking a leg is a permanent or terminal-type injury, of course. I’m thankful that nothing even more serious happened, and that I can go back to a ‘normal life’ (however different that is for any of us). But it changed everything nonetheless. The 6 months I was told I needed to recover are, with today and ‘on paper’, over. And I can walk and drive. I can look after all my boys and my house. I can do what I need to do in my daily life. But I’m in pain. And I have a limp. And I can’t run. I’m having physio and struggling to see an improvement, although I’m told I am improving. I know I’ll eventually get rid of the limp and hopefully, one day, of the pain too. But some days (evenings especially) it gets so bad that I can hardly walk. I’m days away from my 37th birthday, and my body finds itself with issues that should have come a good few years down the line. And I know I’ll see an improvement, and hopefully, over time, the pain will fade and go. But my leg will never really go back to being what it was before the fracture. I have metalwork in my leg – a rod that sits with the bone marrow of my tibia and 4 screws to hold it in place. I’m told it can stay there for life. But I’m also told that if I was to experience another blow to my leg (and of course hopefully I won’t!) things may not be very pretty. So that rod I was so grateful for – that rod that allowed me to leave my hospital bed without a plaster cast only 5 days after my fall and that allowed me to walk after only 3 and half months, now is a great cause of anxiety for me. Do I want it in? Or do I want it out? Do I want it in with the permanent fear that something might happen to my leg? Or do I want it out, knowing full well that that means another complicated surgery and about 8 weeks of recovery on crutches? More time out, more help needed to run my life (my house and my boys) and probably more pain and more physio, and something I’ll still be talking about and still be in the middle of in a year or more from now? So yes, that silly fall has changed the course of my life for the foreseeable future. It’s something that truly still affects me 6 months later and will continue to, in a very ‘real’ way for time to come. It’ll be a very long while before it’s a distant memory. And no one can actually guarantee that the pain in my knee will ever go away, with or without the metalwork removed. So a broken leg is about change. And not the type of change that you welcome. But the type of change that stays with you, if not for life, for a very very long time. The type of change that, well, changes you, completely. It’s not just about passive change though – it’s about embracing positive change. I didn’t share this side of my story to dwell on the negatives though. It’s not really what I’m about. Yes, the first few days (and the first couple of weeks) were quite hard. I frequently burst into tears – a 3-hour surgery, anesthetics, morphine, codeine and hormones all over the place from the sudden interruption of my breastfeeding relationship with my son certainly didn’t help. Being faced with my limitations was hard. But for a long time now I’ve been about dealing with what happened and moving on. And I won’t hide that I’m a different person. I have been quite open about my newly-found anxiety, and I certainly do have insecurities I didn’t have before. Maybe it’s early days for certain things – time will help, and anxiety and insecurities will probably run their course and fade away. But breaking my leg has certainly been a catalyst for change. Positive change that I do welcome in my life. It has made this blog exist, and exist in the shape it’s in right now. And of course I wouldn’t really want it any other way. It’s made me explore mindfulness and mindfulness meditation in a more serious and dedicated way than what I would have ever done. It’s made me take self-care and physical exercise a lot more seriously than I would have ever had. And I needed these changes. Because, if there’s anyone who’s really change-averse, well, that’s me. If there’s anyone who really struggles with change, and particularly, sudden changes in routines and life, that’s me. So breaking my leg has enabled me to be different. To try and embrace change. And to intrinsically know what type of person I want to be and what I want to strive for. And I couldn’t write my blog if it wasn’t for this. Breaking my leg completed my story. Breaking my leg is now a part of who I am. So please, take a little step back with me. Because the point of me telling this story is to invite you to take a little step back. From the day-to-day emotions, from the busy-ness and ‘dramas’ that we live daily in our lives (in my case, from the anxiety, insecurities, pain and all the ‘baggage’ that has come from my injury) and look for the teachings we can find. Look at who you are and what you fill your days with, and spend a moment to think about whether you want things to stay that way. Or not. And if there’s anything you want to do differently – if there’s anything you feel, deep down, that you want to change, then please listen to it. And go for it. The changes I wanted to make to my life, and that I’ve now made, had been brewing in me for a long while. I just felt too busy, and I was being too stubborn to listen to the voices within me. It took breaking my leg for the penny to really drop. So here’s why I blog. And why I talk about broken legs quite a bit. Because truth be told, I care. Because I see a lot of women (and especially mums) be the person that I was. And I want you to make the changes you have to make without having to learn the way I did. Because change is hard. But it’s possible. And I’ll continue to show you that it is. Is there anything that you feel you would like to do more of? Or start doing? February 25th is the day my life changed. Everything in this blog is spot on. I broke my tibia, fibula, and dislocated my ankle all in one slip on a stair. A plate, ten screws, and a month later I’m still basically bed ridden. The whole not seeing progress even though others see it is how I feel right now. However, I think this broken leg saved my life. I’ll be forever thankful. And thank you for writing this. I broke my leg on my way from work. Was pushed from a vehicle and still have dreams of it. I just turned 22 and it’s been a week since I started walking with crutches. From a vehicle? Kathryn, that sounds terrible. I’m so sorry to hear this happened to you. I’m glad to hear you’re healing and walking on crutches right now. Good luck with the rest of your recovery – it’s a long journey, but it does get better, I promise. Oh, Nicola, I’m so sorry you’re going through such a hard time. If you haven’t already, come and join the Facebook group intramedullary nail / im nail / tibia nail / rod – you’ll find support and advice that might be of some help right now.